If you've ever felt the cold, cruel stare of the empty page, you're not alone—you're a writer. And every writer develops their own unique writing process to push through writer’s block and complete their work. Maya Angelou wrote from a hotel room and played Solitaire or completed crossword puzzles to distract her “little mind” and allow her “big mind” to think deeply. Haruki Murakami wakes up at 4:00 am, writes for five to six hours, goes on a 10km run, and retires by 9:00 pm. Stephen King writes six pages every day, in the morning while drinking a glass of water or a cup of tea. No matter what schedule or settings works best for you, there are some essential writing process steps that benefit any writer. 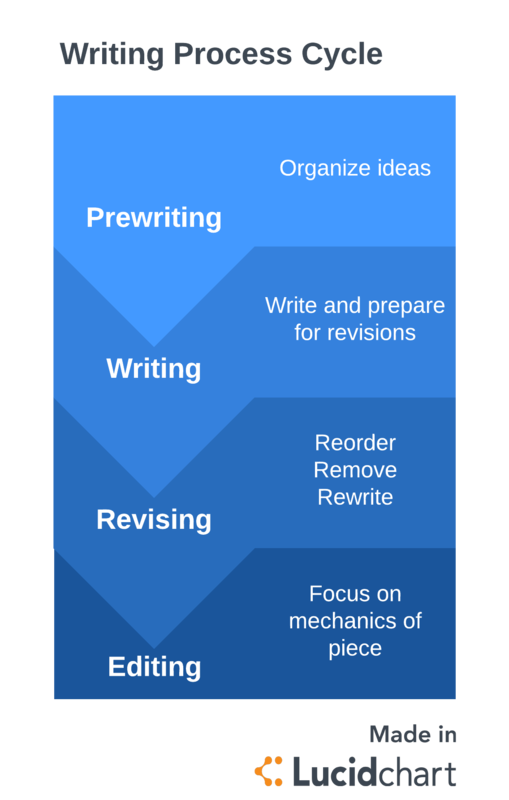 Not only do these tried-and-true steps keep any writing project moving, but working visual elements (using Lucidchart) into the writing process can add new layers of creativity as well. We’re partly kidding, but there’s some truth to the role that procrastination plays in the stages of writing. We’ve all been there—with that unsympathetic blank page beckoning us (or mocking us, depending on your experience) to write something—anything. Stephen King said, "The scariest moment is always just before you start." And that’s coming from a writer who knows a thing or two about what scares people. So it’s totally normal and expected to feel a sudden urge to clean out your garage or start next year's taxes as your writing deadline ticks away. Writing can feel intimidating or even scary at the beginning because it’s like putting together a puzzle and not even knowing what the puzzle looks like. Prewriting helps you identify the pieces and then group them into an outline. This step can include researching, outlining, brainstorming, and note-taking—anything you need to get started. Use visuals to keep track of and organize your ideas. Mind mapping is a concise, visual way of brainstorming that keeps the inspiration flowing. Just open our template below. By this point, you're hopefully feeling a little more acquainted with your topic. You’re no longer strangers, a picture's forming in your head, an outline's taking shape, and you're ready to just start writing. That's the key to the writing stage: to just write. Put the inner critic in your head on mute. Bad ideas and good ideas, perfect words and imperfect words all live together in the writing stage. Resist the urge to self-edit as you go along, and just let the words come out. You’ll have separate rounds for revisions and editing so that you can spend this step solely on writing. Take 20 minutes and just take some time to do anything but write. It might surprise you to see what words and ideas return to the surface after a little intermission. Try freewriting exercises, where you sit down and write non-stop for a set period of time, to bring those subconscious words to light. Whatever you do, do not stop writing. Use filler words if you can’t think of anything, but keep going. After 15 minutes or so, stop and sift through your freewriting session and see what revealed itself. Diagram what you have so far to see if you can find the logical place to continue in your writing. 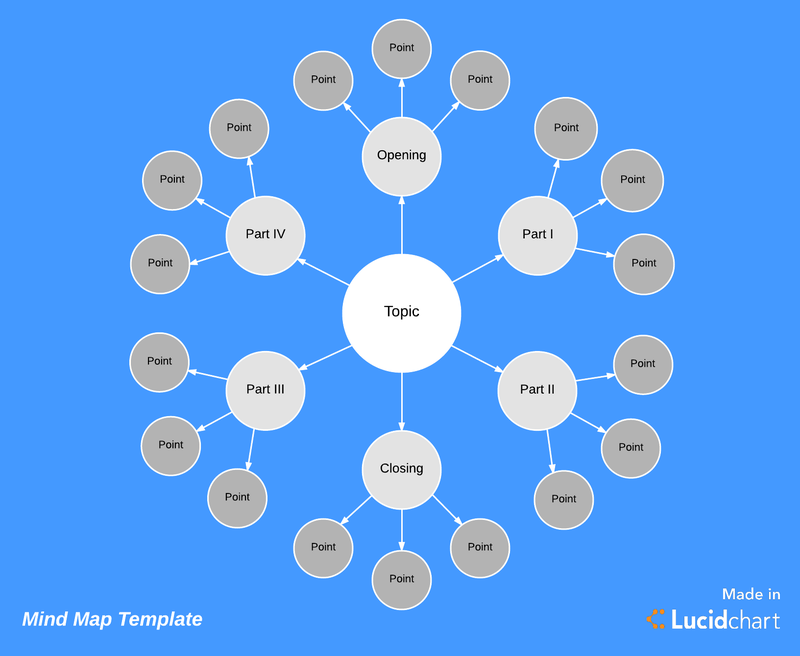 With a free Lucidchart account, you can easily put together a flowchart that outlines your story or article from beginning to end. If you’ve ever truly loved a sports team, then you understand the power and mystique of superstition. Whether it’s wearing your special writing socks or starting the morning drinking your favorite coffee in your favorite chair, setting your own writing ritual sets the stage and puts you in the right mindset to write. Here’s where the puzzle finally comes together. During this stage, you’ll reorder, remove, and even rewrite sections to make sure what you have written clearly conveys the story or information you want readers to know. Wait awhile before you return to your draft so you can approach your writing as if for the first time. The Scott, Foresman Handbook for Writers says to “think BIG, don’t tinker” during this stage. Rather than focus on grammar (we’ll come back to that later), you want to cut ideas that don’t relate to your work’s purpose, improve the flow, tighten up your language, etc. With everything in place, this is the time to cross your t's and dot your i's—literally. Focus on the pure mechanics of your piece, making sure your grammar and spelling is on point. Nothing will distract your reader faster from what you're trying to say than simple spelling errors. You can also ask a friend or colleague to review your piece if you want a fresh set of eyes on it. It's funny the things we miss when we've been too close to a piece for too long. There's an (ironically) unwritten rule that writers must be tortured in order to create anything of substance. If a writer isn't tortured while they write, did they ever write at all?